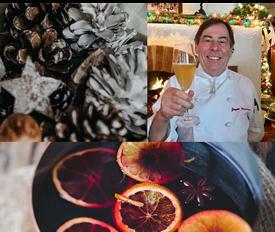 We are très excited for the holidays here at L’Auberge Chez Franҫois; our favorite time of the year, indeed! The extraordinary holiday decorations are up, our three fireplaces roaring inside to warm you and firewood stocked for Jacues’ Brasserie firepit. We have also added new “hot toddies” to our cocktail menu, perfect for sipping around the firepit. Our favorite seasonal dishes are featured on our menus (think Beef Wellington)! In honor of Thanksgiving, we’ve added our pumpkin mousse cake to the dessert menu this month. With many of the same flavors as the traditional pumpkin pie, this dessert is always our most popular this time of year. After Thanksgiving, Papa’s traditional yule log will also be a featured holiday dessert. We’re happy that so many of you choose to spend your holidays with us. Our holiday schedule and hours of operation are located here Holiday Schedule. We also will be open all Monday’s for your holiday celebrations for lunch and dinner, beginning Monday December 10th, 2018. Look forward to enjoying a wonderful lineup of our most popular special events on the schedule for the holidays. These events are a great way to get you, your family and friends into the holiday spirit and into a celebratory mood! 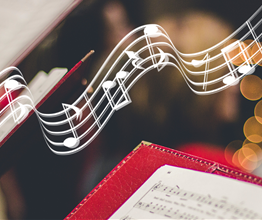 Our ever popular “Holiday Singalong” will be held on December 2. Our December cooking demonstrations and luncheons hosted by Chef Jacques will feature a delectable “Holiday in Paris” and a “Festive Champagne Celebration”. This month’s wine festival will focus on the great wines regions of France. 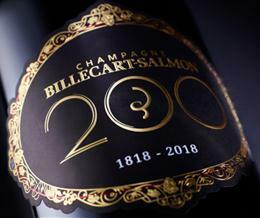 We are proud to host our friends from Billecart-Salmon for a very special 200th year anniversary Holiday Celebratory Dinner featuring all the delicious bubbly of Billecart-Salmon along with Chef Jacques’ five course paired menu. 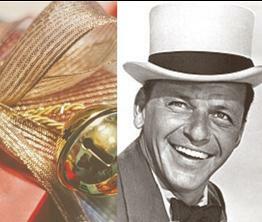 Why not get your holiday “groove on” with a delectable “Frank Sinatra Musical Holiday Soirée Supper” with délicieux wines and our very own “Sinatra”, Jim Gibney with Efi Tovia. Rounding out these festive featured holiday special line ups will be “A Yuletide Holiday Musical Brunch” with the seasonal sounds of a favorite duo of L’Auberge Chez François, Prince Havely, vocals and Efi Tovia, on the piano. Happy Thanksgiving to you and your families! 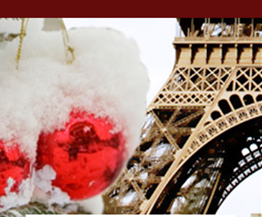 All of us at L’Auberge Chez François hope to see you during the upcoming holiday season. Please join us at L’Auberge Chez François on Sunday, December 2nd , 2018 at 5:00 PM to kick off the Season with our third annual festive and lively Holiday Sing Along Supper featuring all your holiday classics preformed by Prince Havely and Glenn Pearson. Prince brings a level of elegance and style with his vast repertoire and his charm appeals to guests of all ages. Joining Prince will be Glen Pearson, Pianist, Organist, Music Director and Bandleader of the acclaimed dance orchestra, The Floating Opera and the Glen Pearson Jazz Ensemble. Chef Jacques will begin the evening with a Crémant d’Alsace toast to the holidays before the delectable food and music begin. We hope to see you there! Please join us as we continue to usher in the holidays “L’Auberge Chez François style”, on Friday, December 7th, at 11:00am. Chef Jacques will be hosting “A Holiday in Paris” cooking demonstration and luncheon, featuring the delectable cuisine and wines inspired by the romantic French capital. You will be transported to the magical city of Paris as you sip sparkling wine and learn how to prepare Parisian classics that are fit for your holiday table. Lobster martini with caviar, foie gras, and Papa François’ Holiday Yule Log are all on the menu for a decadent cooking demonstration and luncheon that will put you in the mood to celebrate the holidays Parisian-style. Vive La France et Joyeuses Fêtes! Please join us Friday December 7th, 2018 at 7:30 PM, for what promises to be an extraordinary all-Champagne Holiday Soirée, celebrating Maison Billecart-Salmon’s 200 year anniversary. Billecart’s French Ambassador, Clement Calleja, will share his passion for these luscious bubbles with us on this festive evening. Billecart-Salmon offers distinctive and elegant champagnes from one of the few remaining family owned and operated Champagne houses left in France. For over 7 generations, each member of the family has endeavored to continue the family tradition, staying faithful to the same motto: “Give priority to quality, strive for excellence“. Join us for a sparkling Champagne Reception followed by a multi course men, in our beautiful Garden Room, surrounded by our twinkling lights and Holiday decorations. A very festive holiday soirée not to be missed. Joyeux 200th Anniversaire et Joyeuses Fêtes! 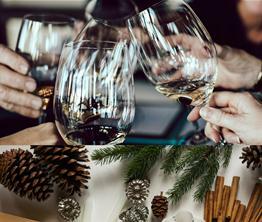 Chef Jacques, Paul Haeringer, and our team at L’Auberge Chez François invites you to our annual Holiday Wine Festival and Luncheon on Saturday, December 8th 2018. Please join us any time between 11:30am and 1:00pm for a walk-around tasting of twelve fine wines, accompanied by Chef Jacques’ seasonal canapés. The tasting will be followed by your choice of lunch from our four-course winter menu, paired with an additional glass of wine.For this very special holiday wine fest event, our team of sommeliers have selected twelve “vins très spéciaux” (very special wines) from around France that are perfectly suited for your holiday table or to be given as a gift to the wine-lover in your life. This annual wine tasting has become a favorite of our patrons and we look forward to welcoming you to this holiday event. Join L’Auberge Chez François on Sunday December 9th, 2018 at 6:30 PM and get into the holiday swing with a delectable Holiday Soirée dinner, délicieux wines AND our very own “Sinatra”, Jim Gibney with Efi Tovia.Jim has been a singer/bandleader throughout his storied musical career. Jim spent 10 years performing with Gene Donati Orchestra. Efi Tovia, a wonderful entertainer and cabaret singer himself.We’ve got the world on a string, and on this holiday soirée, we will snap our fingers, while Frank croons the holiday favorites of Sinatra, (of course), Bing Crosby, Johnny Mathis and Nat King Cole to name a few. We also will toast “Frank” on what would be his 103rd birthday. We hope to see you there. Happy Holidays! Celebrate the holidays in style with a Champagne Celebration cooking demonstration and luncheon on Saturday, December 15th, 2018 at 11:00am. Chef Jacques will be entertaining our guests with a lively cooking demonstration highlighting Champagne, of course, followed by a very festive feast featuring delectable scallops, caviar, classic lobster Thermidor, Valrhona chocolate, and yes please, more bubbly, oui – bien sur! According to L’Auberge Chez François tradition, we offer these featured wines for purchase, at a special price for you to enjoy at home, with family and friends, or at your holiday parties. 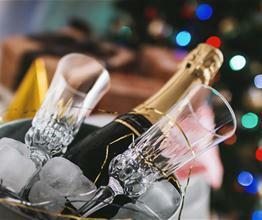 Eat, drink and be merry this season at L’Auberge Chez François. Bonnes Fêtes, Season’s Greetings, and Happy Holidays! Please join us at L’Auberge Chez François on Sunday, December 16th, at 11:00 am for a delectable Yuletide Holiday musical brunch featuring a favorite duo of L’Auberge Chez François, Prince Havely, vocals and Efi Tovia, on the piano.This duo is one of the most recognized talents in the region and it’s no secret why! They have entertained our guests at numerous sold-out performances at L’Auberge Chez François, and this is sure to be another memorable event.Dine on house-made croissants, brunch cocktails, and a selection of Chef Jacques’ very special holiday favorites (oysters, mushrooms, lobster, caviar, foie gras, filet mignon, and chocolate, oh my) while listening to the seasonal sounds provided by Prince and Efi. You’ll be sure to get into the holiday spirit in front of the fireplace surrounded by our sparkling lights and decorations. We hope to toast this holiday season with you and yours! 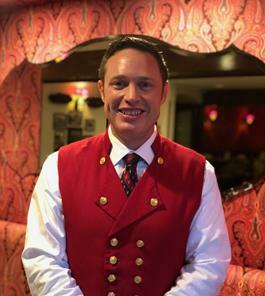 David Berry began working at L’Auberge Chez François in May 2013. David is a professional server, and with his diverse background in food and wine, offers our guests a delightful experience. 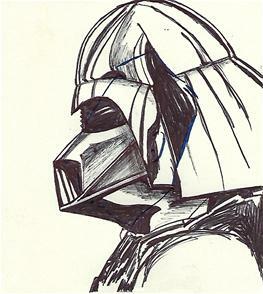 He always has something to add to the conversation, and never hesitates to give a word of advise to his coworkers. We thank you David for your many years of service. Congratulations to Astrid D. of Alexandria, Virginia for winning the October Monsieur François’ Profile Embellishment Competition. Astrid will receive a $200 gift certificate to L’Auberge Chez François. Please be sure to follow L’Auberge Chez François on Facebook, Twitter, and Instagram for behind the scenes photos, specials, and more.